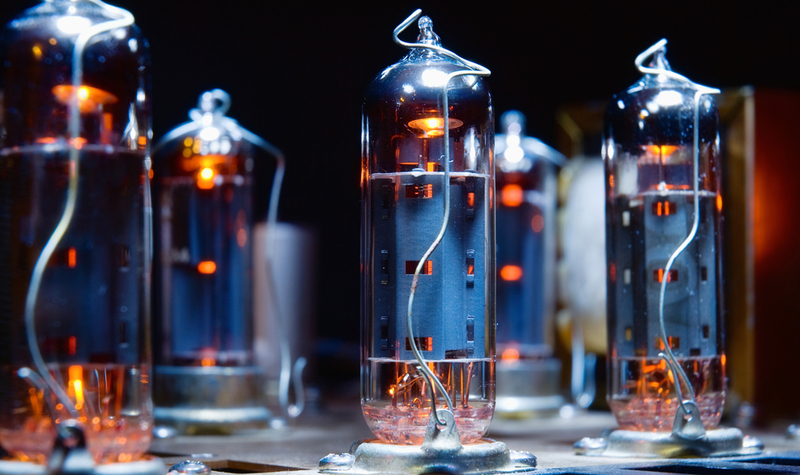 At the heart of the problem of component obsolescence is Moore’s law and the ever-shrinking dimensions of the transistor, the essential atomic building block of an integrated circuit. Moore’s observation that the number of transistors in an integrated circuit doubles every second year has held true for 50 years, and the rate at which the number doubles is only now slowing down. Miniaturisation has brought steady improvements in aspects of performance such as switching speed and power consumption, but make no mistake, the primary driver for – and over-riding motivation behind this rapid technological development has been cost savings. A smaller transistor occupies a smaller area, and in the silicon world, cost is proportional to consumed area. Take Intel’s recent transition from a 22nm to a 14nm process, which coincide with their change from the Haswell to the Broadwell processor families. Based on the same microarchitecture as the Haswell processors, the Broadwell nevertheless boast a 35% increase in the number of transistors while their die size has shrunk by 37%. Intel did not transition from a 22nm to a 14 nm process in order to offer us all better performance and added functionality (important processor performance parameters like clock speed levelled off a decade ago). Their sole motive was to convert the area reduction into a cost reduction. The added functionality was simply thrown in as an incentive to computer makers and consumers to switch to Broadwell as quickly as possible. As a process with smaller feature sizes comes on line, a chip manufacturer starts to port its high-volume products to the new process in order to realise the cost reduction it offers and get a return on the cost of developing the process. Low runners are left behind and as their volumes drop, the manufacturer seeks to limit its obligations to customers and to shut the process down. This is when the manufacturer issues EOL notices. On the one hand, market segments with lower volumes benefit tremendously from this: the incredible volumes of the consumer market supports a development model that delivers vast computing power at a very low cost. On the other hand, those segments with product lifetimes of a decade or more must learn to operate with a supply chain geared for product life times of only one or two years. Obsolescence is nothing new, but it is becoming more and more serious as a product maintenance problem. What began as an irritation has gradually become a serious burden to many organisations. The fact that this has happened gradually may explain why many organisations still deal with it in a reactive manner. Typically nothing happens until the company receives an EOL/LTB notice. That then triggers a frantic attempt to size up the last order, an activity that must normally be concluded within 180 days. Very few companies have forecasts allowing them to see a decade into the future with any precision, and the many uncertain variables that must be taken into consideration make it an almost impossible task to strike the right balance between opportunity and cost. 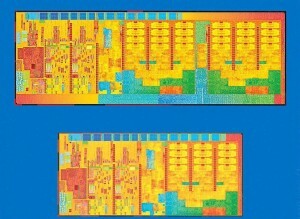 Haswell (top) and Bradwell (bottom). Die shrink in the transition from a 22nm to a 14nm process (source: Intel)Buying and stockpiling components create other problems too. Even when the future need is correctly estimated, components in storage may represent a significant, if not unacceptable, amount of tied-up capital. Reserve charges and an increased reluctance among distributors to hold inventory for more than two years will affect the business case for continued manufacture of the product. Besides, electronic components go stale. After a couple of years in storage, the solderability suffers, leading to a higher yield loss. This is bad enough under normal circumstances, but it is much worse when the lost parts cannot be replaced. Moreover, maverick lots in storage may go undetected for years causing yield and reliability problems long after the expiry of the guarantee and end of support from the supplier. A need for parts a long time after LTB may tempt buyers into the grey market, where all the fake components are. Although it can extend product life for a few years, the reactive approach is seldom viable. Each category may then be associated with an obsolescence risk calculated on the basis of the probability of obsolescence and the consequence if it happens. Once obsolescence is viewed in terms of risk, it ceases to be an unpredictable and devastating “force majeure” and becomes instead something that can be managed with well-established techniques of risk tracking and mitigation. Category A components represent the highest obsolescence risk, which means they must be given priority in a good obsolescence management strategy and tracked more closely than the other categories. And while an embedded circuit board may comprise a few hundred individual part numbers, there will typically be no more than a handful of category A components among them. The majority will fall under category C which may safely be tracked only casually or not at all. The task is suddenly far less daunting. Mitigation, when EOL strikes, will also be different for each category. For category A components – which are by nature unique – there may be little option other than to perform a Last Time Buy to forecast. But for category B parts the primary mitigation technique is to search for and evaluate replacement parts. When this is performed up-front and resulting in an Approved Vendors List (AVL), the obsolescence of parts have no particular consequence and may be handled as part of the normal procurement and manufacturing activity. Another element of a proactive obsolescence management is the use of planned technology refresh cycles. Keeping a product alive for decades will often require one or more design revisions to replace obsolete components. Based on the anticipated lifespan of the category A components, the refresh interval may – to great advantage – be decided already during the initial design phase. Doing this divides the active life span of the product into shorter periods of defensive logistic obsolescence management, each separated by a technology refresh release. The first advantage of this is that, whereas forecasting and stockpiling for 10 years might not ever be viable, doing so for three or four years (until the next technology refresh) is normally quite straightforward: instead og having to bridge an indefinite parts gap, Last Time Buys performed in this context only need to bridge a parts gap until the next planned revision of the product. Secondly, the use of planned refresh intervals makes the design resource requirement visible in the organisation as each revision is planned and not a suddenly conceived and hastily executed stunt project performed to fulfill an unexpected order. Unplanned revisions will burden any design team as the time-line is often tight and the necessary design resource already allocated to other tasks. Planned revisions, on the other hand, contributes quality to the design and future proofing, as the purpose of the revision is to consider the life expectancy of the entire design not just the obsolete parts. Thirdly, making plans for technology refresh cycles during the initial design phase forces designers explicitly to consider the life expectancy of the parts they choose, and this will in turn influence key design decisions such as part selection and architecture. A design is a series of trade-offs made under pressure of time and cost, and product life expectancy does not always get the attention it is due in the process. Effective tracking and mitigation strategies aside, the long-term sustainability of an electronic circuit board is no doubt contingent on choices made during the design stage. This is obviously the case during the part selection process as all parts causing an obsolescence problem were once selected during a design phase. However, it is an illusion to think that making the “right” component choices may solve the problem of obsolescence. A wiser view would be that due consideration of a part’s life expectancy contributes to an overall obsolescence management strategy. Knowledge of the suppliers and their markets, as well as their commitment to their own and industry roadmaps should inform parts selection. After-market support and extension of life programs are important, and it is crucial to consider the intended market for a given component. Parts intended for the automotive market will be around for much longer than those meant for tablet computers. Individual parts may perish, but the overall architecture must stay the course. It might limit the scope of mid-life technology updates, and it helps reduce the extent of the re-qualification that is required after a design change. An enduring architecture favors a modular design with thin and standard interfaces between sub-systems. The general drive towards higher integration obstructs this goal, but designers should be conscious that a very integrated or convoluted design is hard to maintain and may require an extensive re-design effort. Also crucial in its bearing on choice of architecture is the realisation of the fact that software development costs always exceed hardware development costs even for simple systems. And the gap between the two will only expand with time. Hardware resources are abundant and easy to include but making them useful requires software effort, and coding efficiency is not likely to increase sharply anytime soon. Consequently, a system design intended to last for decades will be one that limits the software effort required after a hardware design update. Preferred characteristics are modular designs and layered SW structures. But the most important thing to realise is that system design for long product life is a multi-disciplinary undertaking. The emergence of businesses offering solutions of various kinds bears witness to obsolescence as an escalating problem. A range of companies provide logistical help in the form of planning and tracking tools as well as database and other services. Another niche is filled by operations like German HTV who offers a proprietary long-term storage and conservation process for components and assemblies; they claim to decelerate the component aging process by a factor 12-15. Paired with on-going test and monitoring, their offer makes it technically viable to stock components for one or two decades. A very distinguished position in the component obsolescence industry is held by Rochester Electronics. Supplied by a great number of the major semiconductor manufacturers they take over processes and portfolios once retired by the original manufacturer. Their warehouse presently holds more than 10 billion “obsolete” components of their own manufacture, and they even offer part re-creation as part of an overall service called Extension-of-Life®. The concepts and techniques discussed in this article are only elements of a proactive approach to life-cycle management. How these elements are used as part of an overall obsolescence management strategy depends on the product in question. Someone who earns a living by making and selling off-the shelf single-board computers will take a different approach from someone who uses embedded electronics as parts of a much larger and more expensive system. The former must account for the premium necessarily added by life-extending measures on a board-by-board basis while the latter may rather view it as part of an overall system cost picture. Constructing the right strategy may be hard, but technology companies will find it increasingly difficult to survive in modern market conditions without a sustainable product maintenance strategy. The number of transistors in a dense integrated circuit doubles approximately every 2 years. 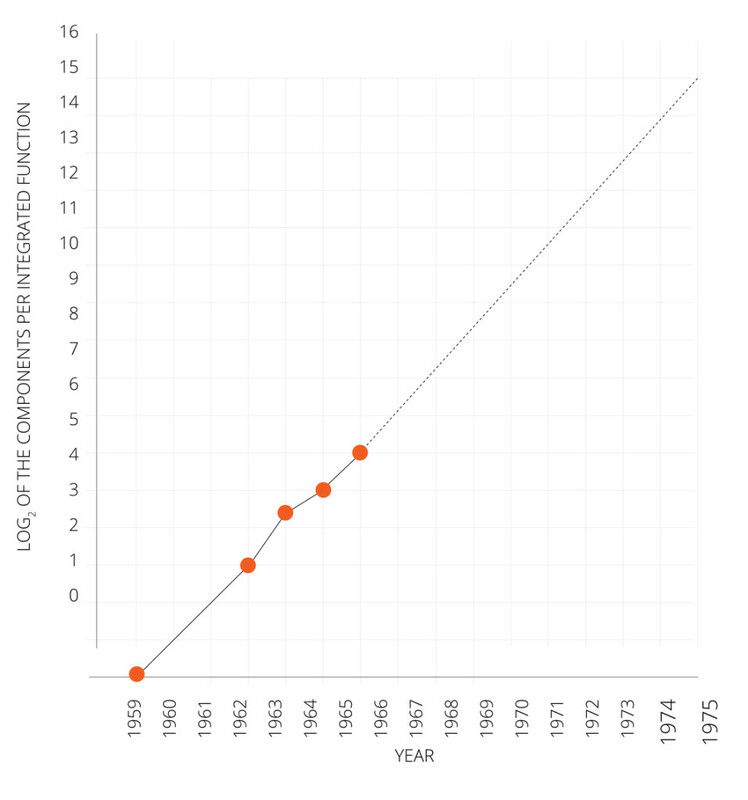 Moore’s original paper predicted a doubling every year, but he modified it in 1975. Recalling that the integrated circuit or “chip” was invented only three years earlier, the relative adherence to Moore’s law 50 years later is evidence of its influence as a roadmap. Moore’s actual agenda was to say something about cost optimisation in chip-making. The problems of component obsolescence and counterfeit parts are close cousins. Fake parts find their way into equipment of all kinds including military airplanes and weapons systems. A substantial majority of these components mimic hard-to-find parts discontinued by their original manufacturer. In the next article in this series, we take a closer look at the issue of counterfeit electronic components, the industry’s response to it and the protective measures available to companies making electronic products.